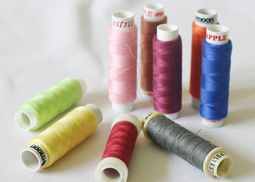 » Does Sewing Thread Expire? What To Do With the Old Thread? Even though you may think that buying a large box of vintage thread on sale sounds like a good idea, it may turn out to be quite the opposite. You know how all good things come to an end? Well, not to be overdramatic, but this applies to thread, too. Sadly, thread can’t last forever. Can you use old sewing thread? Well, you technically can. But should you use it? We’d say probably not. Sometimes, even though the thread you have might look just fine, it can turn out to be too old to do the job. As a result, it will lead to uneven coloring and breakage. 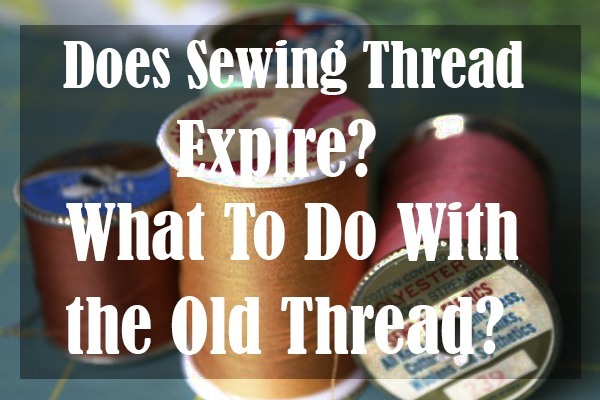 Although the expiration date isn’t that visible on the thread, there are still some tricks on how to determine whether your thread is going to fail you or not. There are no spools with a set expiration date on them but there is a number of variables that will affect the thread. 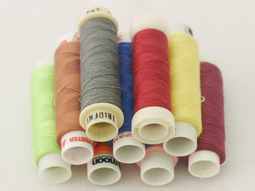 Some of these variables include the quality of the thread, the material of the spool, the thread material and many more! So, while you may not be able to determine whether your spool is good to go based on how old it is, there are still plenty of ways to test its usability. And, in order to find out how you can do this, stick with us! Today, we’ll go over everything you need to learn about thread! We’ll start by explaining how sewing thread gets too old to use. Then, we’ll break down some crucial tips for you to be able to determine whether your sewing thread is too old. Finally, if you do have a thread that’s too old, we’ll teach you what you can do with it. So, make yourself comfortable and read on! Does Sewing Thread Get Too Old to Use? What is The Shelf Life of Sewing Thread? What to do With Old Sewing Thread? As we’ve already mentioned, sadly, the answer is yes. The thread won’t last forever and that’s the sad truth that we have to accept. That’s why it’s extremely important to know what supplies are safe to use and which ones are ready to hit the trash can. Before grabbing your favorite old spool, remember to test out its usability. In fact, using an old thread on new projects is pretty risky at best. No matter how adorable those little vintage spools may look to you, you might want to stay away from them. You know those little bits of fluff that you can see on the throat plate of your machine? Well, even though you might have thought these were from the edges of the fabric as it went under the needle, that’s not the case. These bits of fluff are from the thread itself! This may appear on a thread of a low-quality. And, you can spot a low-quality thread by noticing how it has lots of little fuzzy bits hanging off the sides or variations in thickness across the length of the thread. Well, those exact tiny bits get “shaved” off in the eye of the needle. And, once that happens, the thread becomes a lot weaker. As a result, you’ll end up with a weakened seam, which won’t have that same stress which a fresh thread would. A cheap and old thread will make your creations weaker. And, we’re guessing that’s not the style you’re going for. So, in order to avoid making your seams weak and worn-down, keep on reading. Now that you’ve learned how an old thread can’t last forever, it’s high time we’ve shared with you how to spot one. Being exposed to light will eventually cause the thread to weaken and fade. 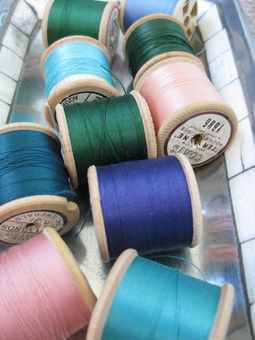 Therefore, if you can notice that your thread color has changed and that it’s visibly faded, you might want to say goodbye to that one and go shopping for a new thread. Another factor to consider is humidity. Humidity can be a powerful enemy to your favorite spool. In fact, if you’re living in an area with an extremely dry climate, your thread might become brittle. And, in a more humid area, a thread will inevitably become rather sticky. In addition to that, it can even mold. So, if you notice a sign of your thread becoming too brittle or too sticky, you might want to get rid of it. Dust —don’t even get us started on this one. We all hate dust - it’s annoying, filthy and it’s everywhere! Well, dust can settle on your spools. And, that means that while you thread the machine, it will get pulled right into the tension discs. As a result, that might bring your stitching to a screeching halt. In order to make your thread last long, we recommend taking care of proper storage. Proper storage will mean everything when it comes to preserving your thread. Our advice is to keep it wound very tightly. That way, you’ll prevent it from tangling. And, most importantly, you need to make sure to keep it hidden from direct exposure to light and dust. Reducing the exposure to these factors will have a significant impact on its durability. You can take a piece of that thread, and make sure that piece is as long as your forearm. Then, go ahead and tie a sturdy knot in the middle of it. After that, start pulling gently from both ends. By doing that, you will be testing both the knot and the thread itself. You might not be aware of this, but the strength of a thread or a rope is reduced by half once you put a knot in it. Well, there’s another useful fact you’ve learned today! Going back to our experiment here. If your thread breaks when you pull it, consider this day as its retirement day. If it resists your efforts, you can go ahead and start your new project without worrying about the thread! We can’t possibly tell you exactly how long your spool of thread will last. It may be ten, twenty or even fifty years! Its shelf-life will depend on a number of different factors. And, since we’ve mentioned one of the most important (if not the most important) environmental factors, we’ve decided to share others, too. That way, you’ll know what you can do to keep your thread safe for a long time. Let’s face it, we’ve all been there: picking up a spool of thread from our favorite stash, getting hyped about our new project, only to find out that the thread isn’t good enough. It may discover a completely different color hiding underneath the first layer. Or, it might start breaking apart as soon as you start working with it. Well, little did you know that this is all because of a thread that has gone bad! In fact, main symptoms of a thread gone bad can be faded coloring, brittleness, weakness, bleaching and disintegration. Aside from the environmental factors that we’ve covered earlier, there are numerous storage-related factors that may ruin your thread! 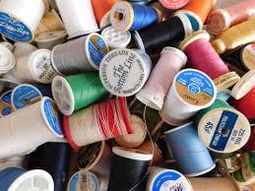 If you tend to toss thread spools willy-nilly, you’ll only end up battling with tangles and saggy, loose spots on your spools. That’s why we can’t stress enough how important it is to store your thread in a well-maintained and organized manner. We would like to recommend staying away from storing your thread loose in containers, drawers, bags, and pouches. Storing your thread by keeping it separate from other spools is the way to go. That way you won’t have to deal with tangled, lost and loose threads anymore! Thread racks are a super-easy, user-friendly way to keep your thread organized and safe. Essentially, a thread rack will offer you rows of spool-holders. And, these racks can either sit on a flat surface, such as your working desk, or you can hang them on a wall. In fact, you can even make one by yourself! These racks are usually made out of pegboards or wooden boards. They will make it easier for you to keep your threads visible and always at hand. But, there are some issues with thread racks, which might cause your thread to age faster. For instance, since the racks are out in the open, they will collect dust. In addition to that, chances are the exposure to direct light will also be present. So, if you absolutely need to use a thread rack, we recommend giving some serious thought to where you want to put it. And, don’t forget the regular dusting! Unlike the racks, thread boxes grant you some coverage. Thread boxes come with a lid and small compartments, as well as spool-holders that will keep your thread well-organized. These boxes will save your thread from light and dust, too! That’s why we’d definitely recommend using them! Basically, almost any box or even a simple drawer will work as a solid storage space for your thread. In fact, you just need to make sure each spool is separated from the other and there’s no dust interfering with your thread. And, that’s it! The worst possible choice would be to store your thread in a plastic bag. As a matter of fact, just think about the humidity, particles of dust and other stuff floating around with your thread. That has to sound awful, right? Well, try adding the chemicals that will seep out from the bag as it sits there for a long time to the equation. And, voila! There you have it — a perfect recipe on how to ruin your thread. Please remember that the thread needs to breathe. That’s why keeping it sealed in a ziplock or plastic bag is a definite no-go! There are types of threads that will outlast your fabric! Some of these are threads made out of fluoropolymer and polytetrafluoroethylene. Both of these thread types come with a lifetime guarantee. In fact, they are completely resistant to UV rays, pollution, rain, cold, snow, and rot! And yes, they are way more expensive than other threads, too. However, their performance benefits should outweigh the priceyness at any given time. Just think about it, they might cost you more upfront but there will be no need for restitching. Therefore, it’s an investment that will eventually pay off! These threads are usually used for marine, outdoor and awning applications. In addition to that, they are slightly trickier to sew than a regular thread. A great alternative to these two sturdy thread types is polyester. 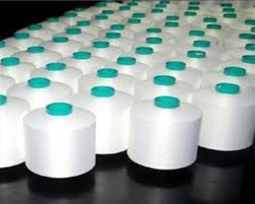 Polyester is pretty famous for its durability, strength, sturdiness and low shrinkage. And, polyester has proven to be quite resistant to UV rays, too! In addition to that, moisture will have little to no effect on it. However, prolonged exposure to direct sunlight will inevitably lead to weakening. Also, when it comes to the colors, a polyester thread comes in a number of them, which makes it quite easy to match to almost any fabric. However, these colors will fade significantly after being exposed to the sun. That’s why we recommend using a UV-treated polyester thread for your outdoor projects, such as cushions, tents, upholstery etc. Unlike nylon thread, polyester thread is of a way higher quality and it won’t rot. As we’ve stated earlier, a high-quality thread will last way longer than a cheap one. Also, the thread produced today will most likely outlast the one that was produced more than 20 years ago. 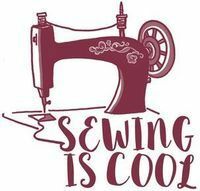 So, even though you may have inherited your granny’s stash, you might want to think twice before starting a sewing project with it. And, if you’ve been asking yourself how long cotton thread lasst, we’ve got you covered! In fact, even the best quality cotton thread that was produced a while ago didn’t have the advanced processing techniques and methods that are available to us today. So, it would probably be best not to sew or quilt with your granny’s thread. Try holding a 1-foot thread between both of your hands Then, quickly pull the hands apart. If the thread snaps and makes a crisp break, it’s okay for you to use it. However, if it pulls apart slowly and easily, you might want to toss it away. And, if you’re working with polyester thread, you won’t have to worry about deterioration. That being said, we can draw a conclusion that synthetic fibers will last way longer than cotton. If you’ve discovered that your thread is too old to use for your new project but you’re still unwilling to toss it away, we get that. And, don’t worry, you might not have to dispose of it! There are ways to still use the thread that has some life left in it. However, make sure you stay away from big and important projects. So, you can start by using your old thread for thread tracing, temporary basting and some smaller jobs like tailor’s tacks. Or, you can use it for some fun DIY projects. For instance, you can fill up a pillowcase with a bunch of old threads. Or, you can try stuffing your dog’s bed with it, too. That way, you won’t have to worry about getting absolutely rid of it. Just make sure you don’t come anywhere near the sewing machine with an old thread. Alright, guys! We’ve come to the very end of this article. Our goal was not only to break the news about the possibility for your thread to go bad but to teach you how to spot it. In addition to that, we’ve shared a list of crucial factors that will accelerate the thread’s deterioration. Also, we’ve given you plenty of choices when it comes to safer storage options. Finally, make sure you don’t risk your projects just because you’re super attached to a vintage thread of yours. If it’s been a long time since you’ve got it, it’s probably a good idea to use it for something else. Now, it’s time to take your sewing stash and test out the threads you have. You might find out that it’s time to go shopping for new ones! And, if someone asks you “Can sewing thread get old?”, you’ll have plenty of stuff to teach them!